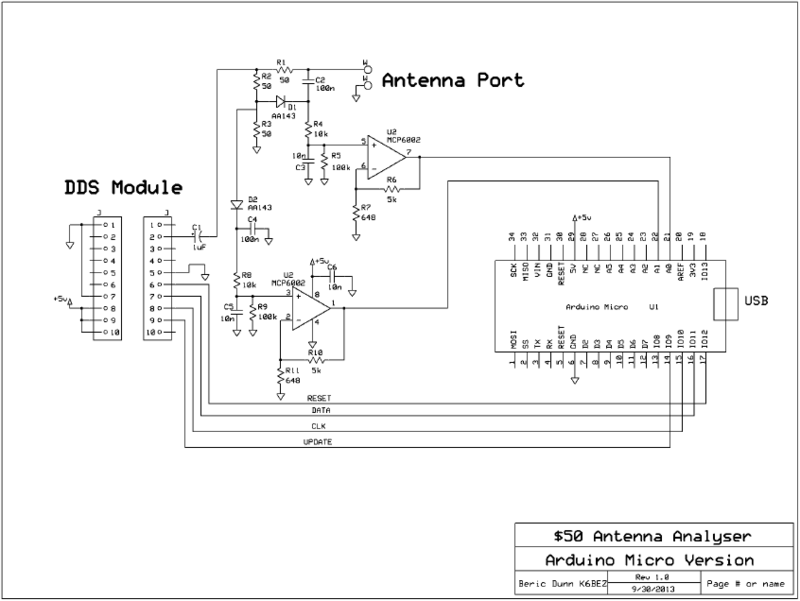 Build a HF antenna analyser for £50! Every amateur radio operator should measure the SWR (Standing Wave Ratio) of their antennas – the SWR is an indication of how much power is being sent to the antenna (the forward power) and how much is being reflected back from the antenna if it is mismatched (the reverse power). Ideally, with a well-matched antenna and feeder, no power is reflected, and all of it is transmitted. However it’s not always possible to achieve this. Different antennas have different bandwidths – the part of the intended frequency range over which the reflected power is acceptably low. Ideally, at the antenna’s resonant frequency, no power is reflected, with this increasing gradually as you move away from the resonant frequency. It’s unlikely the reflected power will be zero across the whole band. When building an antenna – say, for example, a dipole – you cut the legs of the dipole according to the usual formulae relating wavelength, frequency and cable velocity factor, erect the antenna, feed it appropriately, then plot measurements of the SWR across the band, using a SWR meter and graph paper. This gives a graph that hopefully has a dip in reflected power at exactly the frequency you intend to use. Of course, it’s hard to get this right first time, and usually some trimming or extending is required, along with more measurements. This is time-consuming, and error-prone. Enter the antenna analyser, a computer-controlled device that incorporates an RF signal generator that can transmit a low-power signal at a range of frequencies across the band, a SWR bridge that measures forward and reflected power, a microcontroller that records the SWR as the signal generator is swept across the desired range, and a display of the point in the frequency range at which the reflected power is lowest – the resonant frequency. These are expensive – around £400 in May 2014 for a very well-made stand-alone, hand-held graphical analyser from a well-known manufacturer, for example. However, it’s possible to build your own, so I set about looking to see if anyone had published circuits for homebrew antenna analysers. I was not disappointed! The first circuit I found was in the book Ham Radio projects for Arduino and PICAXE, called Sweeper. However, the signal generator board (DDS: direct digital synthesizer) used in this project was not currently available. I obtained one of these for £7.99 from eBay! One article I’ve read suggests that the reason they are so cheap is that the filter circuitry was incorrect for their intended purpose, so they’ve been dumped. However, the filtering is fine for HF amateur radio! The legitimacy of the boards has been brought up with Analog Devices by a columnist in Practical Wireless, with no response as yet. An excellent description of these boards may be found at EIModule AD9850 Signal Generator (with a cached copy here). A project I found that used this board was by Beric Dunn, K6BEZ. Beric’s project page can be found at Antenna Analyser by Beric Dunn, K6BEZ. Beric built three variations of the analyser: a PIC-controlled one with RS232 connection to a PC, an Arduino Micro-controlled one with USB connection to a PC, and a PIC+LCD self-contained one. The Arduino Micro version was costed at $50. I chose to build the Arduino Micro-controlled one, since I have no PIC programming equipment, RS232 hardware is not so easy to work with on modern systems, and the Arduino programming environment requires only a USB cable and works cross-platform. Also, the challenge of building a useful piece of test equipment for $50 was too great to pass up! 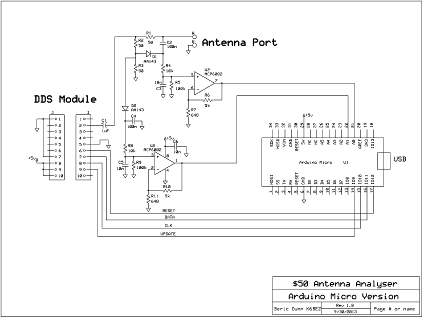 Click the schematic below to view it full size. (Copied from Beric’s presentation). The version of the circuit I’m building is almost the same as above, but adds a voltage stabilising PSU (9-12V to +5V, +8V), and a dedicated ‘Scan in Progress’ LED, rather than the Arduino Micro’s inbuilt LED. 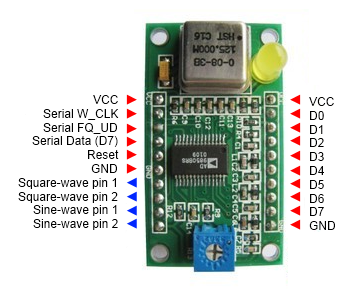 Note that in the schematic, the lower two connections between the DDS and Arduino are labelled the wrong way round: pin 9 of the DDS is W_CLK (CLK); pin 8 is FQ_UD (UPDATE). Beric provides Windows-based software to drive the firmware on the Arduino; I hope to provide a version of control software that’s cross-platform, running on Mac OS X, Linux and Windows – since the current shack laptop is not a Windows one! I had a problem with component availability. Beric used some values of resistor that I couldn’t buy from the two major suppliers I chose (Farnell/element14 and RS Components) – such as 5K Ohm and 648 Ohm. I don’t know if these are readily available in the US, but they’re not in the UK. I changed the 5K Ohm resistor for a pair of 10K resistors in parallel, and the 648 Ohm for a 647 Ohm. The germanium diodes Beric used – AA143 – were not available from my suppliers. I found another eBay seller offering 10 AA143’s for 60p each in a 10-pack. I looked at several SWR bridge circuits online (such as Wideband SWR Meter) and in books for advice, and most of them used more readily-available germanium diodes, but without detailed descriptions of Beric’s circuit, and the choices made when designing it – and my relative lack of expertise in electronics – I tried to obtain the closest matches to Beric’s. A full component list giving UK prices accurate in May 2014 may be found here [PDF]. Prices are given from Farnell/element14, RS Components and eBay (with seller names). I chose to build the circuit on veroboard, since designing a custom PCB is harder, I don’t have the equipment to do it, and veroboard is readily available – it makes it easier to build for hobbyists. The next article in this series will give a veroboard layout, and notes on how to build the analyser. All code, images, documents etc. can be found in the GitHub repository for this project, which you’ll find here. My thanks to Beric Dunn, K6BEZ for the original circuit, and the inspiration to spend £50, and save £350! Also thanks to the authors of other articles that I’ve linked to in this post.